Congress passes legislation clarifying definition of "creditor." After delaying enforcement of the Red Flags rule for more than two years while debating which entities should be covered under the rule and thus required to develop and implement identity theft protection protocols, Congress has passed legislation that clarifies the definition of "creditor" in the rule's language. In so doing, doctors of chiropractic and other health care providers are now effectively exempt from complying with the rule. The Red Flag Clarification Act of 2010 (S.3987) passed the Senate on Nov. 30, 2010 and the House of Representatives followed suit on Dec. 7, three weeks before the Jan. 1, 2011 deadline for enforcement of the rule. President Obama signed the legislation into law on Dec. 18, 2010. Creditors, as described in the Nov. 9, 2007 Federal Register, which published details of the rule when it was announced, were originally defined as organizations or other entities ("financial institutions or creditors") that "offer or maintain covered accounts ... A covered account is (1) an account primarily for personal, family, or household purposes, that involves or is designed to permit multiple payments or transactions, or (2) any other account for which there is a reasonably foreseeable risk to customers or the safety and soundness of the financial institution or creditor from identity theft." While S.3987 does not specifically mention doctors of chiropractic or other health care practitioners, the key language from the amended text appears to be the following: "Excludes from the definition of creditor ... any creditor that advances funds on behalf of a person for expenses incidental to a service the creditor provides to that person." red flag The Red Flags rule was originally scheduled to take effect Nov. 1, 2008, but pressure from Congress and various health care organizations, including the American Chiropractic Association, led the FTC to delay enforcement of the rule five times; first for six months (until May 1, 2009), then until Aug. 1, 2009, then Nov. 1, 2009, June 1, 2010, and finally Jan. 1, 2011. The initial delays were intended to give health care providers and other "creditors" more time to develop and implement identity theft protocols; then to allow time for Congress to decide whether health care practices/practitioners should be exempt from the rule altogether. While few will argue that protecting customers from identity theft is important, who should bear the responsibility for that protection is another issue altogether. Concerns were raised after the rule was announced that, among other considerations, credit-card companies / banks are the true creditors, not the business / practice that accepts credit as payment for services rendered. The Red Flag Clarification Act of 2010 appears to exempt not just health care providers, but also other entities previously required to comply with the rule who now meet the exemption criteria as defined in the amended text. Nearly 30 organizations supported passage of the legislation including the ACA, the American Medical Association and the American Bar Association. In commentary widely quoted online, Sen. Christopher Dodd, D-Conn., chair of the Senate Banking Committee, said the legislation "makes clear that lawyers, doctors, dentists, orthodontists, pharmacists, veterinarians, accountants, nurse practitioners, social workers, other types of healthcare providers and other service providers will no longer be classified as 'creditors' for the purposes of the Red Flags Rule just because they do not receive payment in full from their clients at the time they provide their services, when they don't offer or maintain accounts that pose a reasonably foreseeable risk of identity theft." The U.S. House has passed by voice vote legislation--identical to that recently approved in the Senate--to exempt health care providers, attorneys and certain other service providers from provisions of the Red Flags Rule to combat identity theft. That means the bill, S. 3987, now goes to President Obama for his signature. The Red Flags Rule from the Federal Trade Commission requires businesses that act as "creditors" to take specific steps to minimize identity theft. The newly approved legislation clarified creditors who must comply, in effect, exempting providers and others who do not loan money but permit payment to be deferred. Text of S. 3987 is available at congress.gov. Well, it's beginning to feel a lot like Christmas. Because in Washington, the politicians and bureaucrats just keep on giving. First, we learned that the big Medicare rate cut set to hit physicians' practices on Dec. 1 was delayed for a month while Congress hammered out a longer postponement. Yesterday, we learned that the longer delay -- all the way through the end of next year -- is at hand, though the sides had not yet agreed formally. We've also learned a of Medicare's plans to begin covering a new annual wellness exam and to bump primary-care physicians' pay 10 percent next year. And now we learn that the dreaded Red Flags Rule, which requires lenders to develop plans to ensure that consumers' financial information is kept secure, will not apply to physicians, after all, thanks to legislation passed yesterday in Congress. 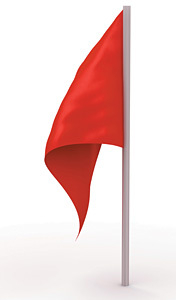 We've been writing about the Red Flags Rule for at least a year and a half now. The rule, separate from HIPAA patient-privacy rules (to which you are absolutely still beholden, of course), required creditors to demonstrate a protocol "for detecting identity theft red flags, preventing and responding to identity theft, and for keeping their program up to date." Under the Federal Trade Commission's interpretation, physicians had been considered creditors if they bill patients for fees not collected at the time of service -- which is to say, everyone except maybe a cash-only walk-in clinic. Now, I still think that having a protocol for preventing identity theft and checking for so-called financial red flags is a good idea. Check out the article linked above by Sara Michael. She suggests things like checking every patient's ID, separating clinical from financial information, and looking out for "suspicious activity." Surely you can do those things. The Red Flags Rule was (and still is, for those covered by it) about protecting consumers from identity theft. Under the new law, you needn't do anything formal to prove to the government you're complying. And that's great news. But your patients are giving you their credit cards, their bank account information, etc., and you still ought to do what you reasonably can to look out for them.